This art came to India with Usta artists from Iran brought here by the emperors. It flourished in the Mughal period in courts and palaces. In the time of Akbar, a group of seven Usta artists came to Bikaner. 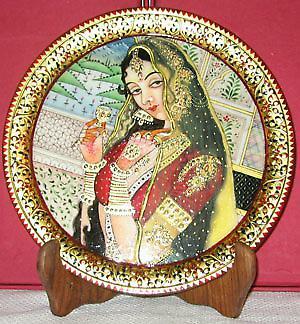 The craftsmanship and skill of these famous artists can be seen even today in the rooms of the Junagarh fort. After the required design is made, powdered pitcher clay is used for embossing. After this, it is painted and gold is applied where required. After this ink is applied with a brush made of squirrel hair and different colours are filled into the design.